When the boys were younger our car situation was a bit easier even though I always hated lugging around the baby car seat. It seemed like everything and everyone had their specific spots and seats in each of the cars. Plus we had a base for the baby car seat in each car we ever drove in. 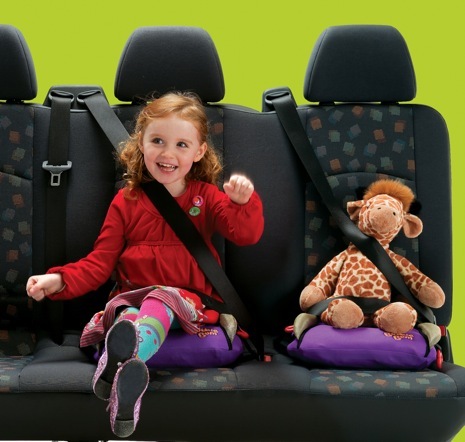 But now that they are both in booster seats it seems like we never have enough. We are always transferring them from car to car which is such a tedious task. 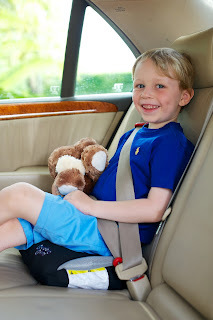 There have even been days where Dane wants to go home with one of his friends from school which means we have to lug the booster seat into class for the next parent to have them safely in their car. And don't even get me started with what a pain it is taking one to the airports! I was beyond thrilled when I discovered Bubble Bum! Bubble Bum is a portable, inflatable car booster seat designed for children between 4-11 years old. It is easily blown up and deflated for easy carry. Bubble Bum "meets all US safety testing standards". It comes available in a bright purple or a basic black. Thankfully they agreed to send me over one for review and now I cannot imagine life with kids without one! This is super compact so much that it fits easily even is a large purse as well as any luggage and it is light as anything to move around. We have honestly fallen in love with having the Bubble Bum around that we are planning on purchasing another one to have around as well as for vacations! Recommendation: These are awesome and very reasonably priced for any income level! In my eyes this gives parents no excuse to not protect their children no matter where they are traveling and in whatever vehicle they choose! I would like to see it available in more color options though! Giveaway: Bubble Bum USA is going to give one of A Lucky Ladybug's lucky readers a Bubble Bum of their own! I would use this for my son if I won. Definitely for my older daughter! I love your giveaways - great stuff. Sometimes, though, I wish there were less entries. Bloggers are going crazy adding so many entries for products worth 30 dollars or less. It's quite a lot for busy moms who also work. That looks much more comfy than the hard stuff!! LOVE it!! This would be for my son when he grows out of his carseat! I'd use it in my car when my niece rides with me. 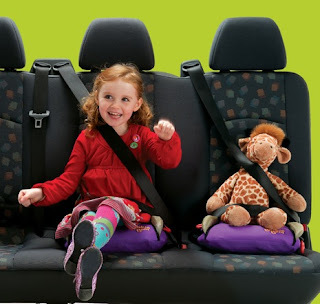 Theres been plenty of times we couldnt take the grandkids somewhere because the boosters or carseats are in another car. We could keep these stowed away for times like that. What a great idea! My car seats are huge, this would be nice when someone else gets my kids at school. I would give this to my sister to use with my niece or nephew. What a neat idea, these would be great for the grandparents to have! I would give this to my niece. She's often with my parents or her other grandparents, so there's a lot of moving carseats around. Thanks for the giveaway! These seats are great! My niece and nephew could both use one of these. For our soon to be foster/adoptive kiddos! I definitely need one of those to be able to see the dashboard. In the meantime, I am using a pillow to sit on. This would be perfect for when we send our oldest son off to grandma and grandpa's house! I would use this for my 8 month old daughter, she needs a new car seat, she's currently in a raggy hand me down. I would keep this at my house for my granddaughters to use. Would love to win this for my son.. he HATES his seat he has now, he says its to hard.. this might be more comfy for him..